Max has spent nearly his entire life in the mountains. Summer or winter, rain or shine, the mountains are where he feels most at home. 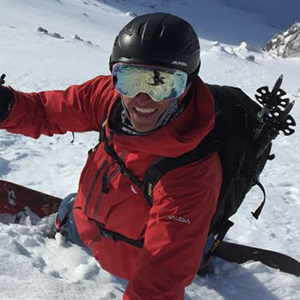 He began snowboarding at age 13 and it has become his life’s passion. He’s traveled to many buck list freeride destinations like Chile, Argentina, Russia, Alaska, and of course, his home mountains in the Alps, in search of deep snow and steep lines. Between 2009 and 2013 he competed on the Freeride World Tour with multiple podium finishes including a 3rd place finish at the Verbier Xtreme and placing third in the overall rankings in 2009. Max’s competition days are behind him, but he is always challenging himself on classic Alpine lines and by touring deep into remote backcountry zones. The experience of climbing and riding Biancograt in the Bernina Alps (4,048.6 m /13,283 ft) is one I´ll never forget. Exploring new terrain and riding some big lines in the Alps! Classic steep skiers like Holzer, Vallencant, Baud, and De Benedetti. They showed us what is possible to ski and ride! The mountains and nature in general.